Zentangle is the brainchild of Rick Roberts and Maria Thomas who sought to create a method for others to experience the sense of timelessness, freedom and complete focus that Maria experienced when doodling. Rick believed Maria’s experience echoed the effects of meditation and the two set out to design a method to bring this to others. The Zentangle method involves creating a detailed artistic image by drawing multiple structured patterns. Rick and Maria claim that when you create a Zentangle you enter a state of relaxed focus that allows intuitive insights to flow freely. They even suggest keeping a journal of your Zentangles as they often reveal insight and answers to life problems. How Is Zentangle Different From Doodling? You may be wondering why you need to follow a special method to create beautiful images. The Zentangle method uses simple patterns and geometric shapes to fill in sections of a larger design. The goal is to let the design flow naturally and take on its own shape. This engages the imagination and allows you to develop insight and intuition. Each line and each shape is chosen with deliberate intent as you complete the image. It is the creation of a larger design without forethought or a preconceived notion of what it should look like that frees you to access your natural artistic side. There is no right or wrong way to create a Zentangle and each will be unique in shape and design. How Do You Know Which Shapes To Use? You are free to use circles, triangles, squares or any shape you please, but they should become part of a repeating pattern for that section of the Zentangle. 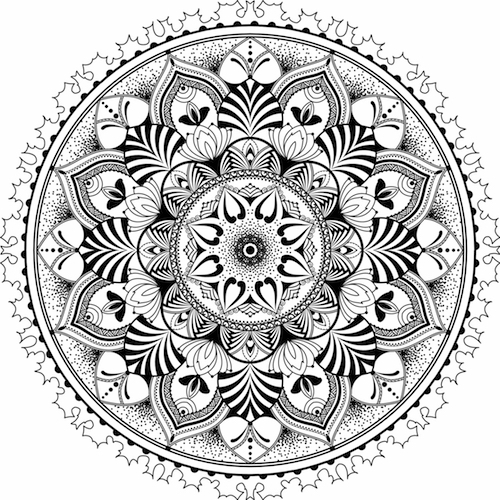 For example, you may wish to fill in the petals of a flower with a checkerboard or circles of varying sizes or create a mandala with your Zentangle designs. But you don’t need to rely on your imagination alone. There are many basic patterns available to get you started. Where Do You Find Zentangle Patterns? You can purchase an official Zentangle kit that contains tiles for tangling. Each tile contains a small basic design, such as a flower or other simple outline for your initial tangles. An accompanying legend shows you how to create 48 different designs for filling in areas of your Zentangle. The kit also provides the needed tools (pencils, sharpener and smudge tool) to create the sample designs. It also includes a DVD with instructions to get your off to a good start. When completed, the tiles can be used to create a mosaic of your Zentangles. There are also several books on the market that provide easy Zentangle patterns and provide you with the basics. You can also find free downloadable patterns online. All Things Tangled offers a gallery of tangle patterns that you can use for personal use or adapt them to meet your personal taste. You can combine the designs to create a unique tangle. All you need is paper and pencils or pens to begin your first Zentangle. Do You Need To Be Artistic To Do Zentangles? According to the founders, the process of creating Zentangles frees the imagination and allows your natural artistic side to take over. Because simple designs are combined to make a more detailed image, if you can draw simple lines and shapes like a circle, square and a triangle you can make a Zentangle. What Do You Do With Zentangles? The main purpose of Zentangles is to promote relaxation and well-being, but that doesn’t mean the end results aren’t beautiful works of art. You can frame them, create a journal with your Zentangles or convert them to transfers and add them to crafts, wall hangings or quilt pieces. Zentangles can also be used for gift cards and in scrapbooks. Zentangles make excellent gifts. Zentangles are for everyone from children to the elderly. In fact, there is a special kit designed for kids as young as four-years-old. Teachers can use Zentangles in the classroom to help children relax and focus. Some prefer to work together in a group setting, while others prefer Zentangling privately. They can be used as a tool in meditation. Zentangling has also been used in therapeutic settings. How Do You Learn To Zentangle? If you just want to try your hand at creating these beautiful designs, there are several videos available from a variety of sources on YouTube. You can also purchase Zentangle books or kits that include basic instructions. If you wish to take your new-found skill to new levels, Mike and Maria (and other trainees) offer Zentangle workshops that promise to be uplifting events. 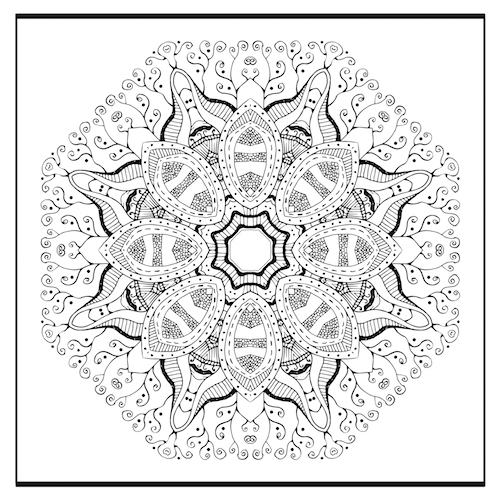 You can even become a Certified Zentangle Teacher (CZT) and offer workshops of your own. Whether you are looking for a new way to express your in-born creativity or are looking for ideas for activities to promote relaxation and focus, Zentangle may be the answer for you. Start small with a simple design and let the creative muse take over. You may be surprised at the beautiful work of art you produce, even if you thought you were not artistic.